Start Anywhere along Highway 431 where it borders Tahoe Meadows. 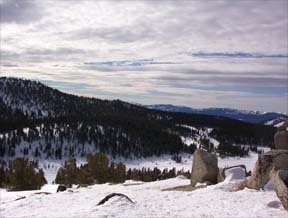 Tahoe Meadows begins 6.1 miles northeast of Highway 28 and 0.3 mile southwest of Mount Rose Summit. The relatively high altitude and the lack of vegetation make Tahoe Meadows a good choice for skiing very early in the season. There is plenty of easy touring and good opportunities for beginners to master the fundamentals of cross-country skiing. The large, flat, open meadow on the south side of the highway is the easiest terrain. 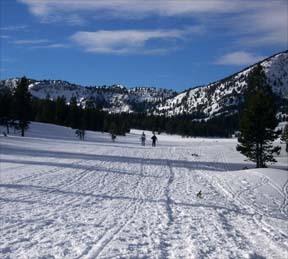 At the northeast end of Tahoe Meadows, but still on the south side of the highway, near the summer campground and off-highway plowed parking area, you will find more hilly terrain with small knobs to explore. On the north side of the highway and next to the road the meadow area has a slope that attracts snow-players. This area is also open to snowmobile use. There are several things worth noting before choosing to ski in the Tahoe Meadows area. First, the high altitude and the openness of the area make it susceptible to high winds; this can result in wind-packed snow, which is poor for skiing. Although the easy terrain near the highway is relatively safe, there are other, steeper areas nearby that should be considered avalanche prone.